Every week, my father-in-law makes a trip to his hometown of Signa (about a 15 minute drive) to make the rounds and say hello to old friends. I don’t remember the first time, when he brought back the so-fresh-it’s-still-warm bread back for me to try…but I do remember it was love at first bite! So now it’s a tradition, on his way home he always stops by to pick up two oily, delicious pieces of schiacciata one for me, one for him. I’m a carb kid. I’d much rather eat a slice of fresh baked bread with butter (or now, olive oil) than chocolate any day. The good thing about Tuscany is that every town has at least one bakery, and along with the 1/2 kilo loaves of bread for the table, they alway have schiacciata on hand (or until they run out, which they usually do, so best get here before 10). I’ve savored many a slice, and while they’re always delicious, this place is the BEST! 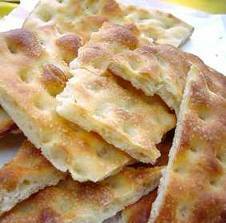 Schiacciata (pronounced ski-a-cha-ta) is a very loose term for flat bread, and everywhere else in Italy, it’s known as focaccia. The varieties are endless. The most basic form is just the bread with olive oil, but walk into any pizza a taglio (pizza by-the-slice) shop and they usually have an assortment of toppings, ranging from potatoes to onions as well as little sandwiches. There’s also different heights. At a restaurant, a typical schiacciata is basically thin-crust pizza, where as at a bakery they’re usually at least an inch thick. ‘My’ schiacciata is a little less than an inch thick, with a hard, slightly oily, salty crust on the top, a thin layer of soft bread and then the bottom is hard usually dusted in flower. It’s heaven. I usually just eat it as is, because why mess with perfection? But I didn’t have any bread in the house today and I was in desperate need of a sandwich. 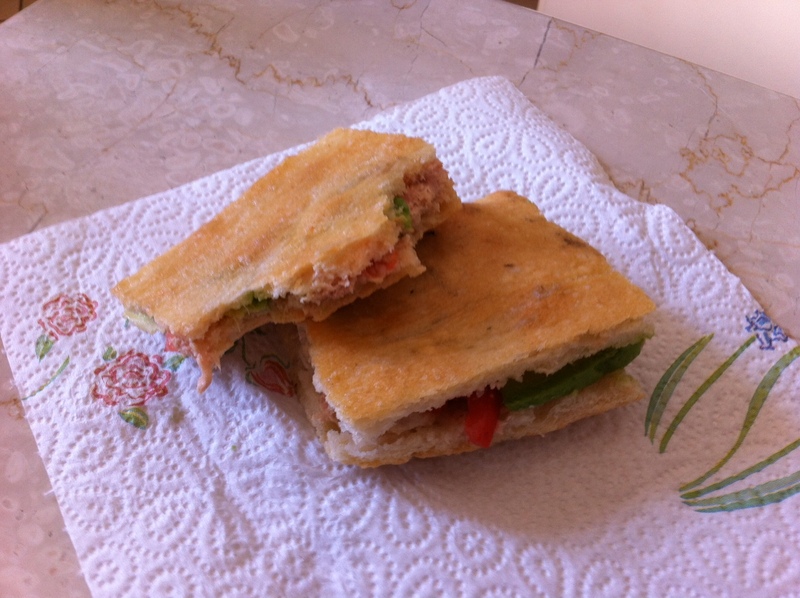 Let’s just say the bread plus the tuna, tomatoes, pearl onions an avocado (which are sadly, nothing like those from California) made for, dare I say…a near-perfect panini! Of course, now, I get all these pangs, realizing that soon this will all be very far away. Obviously, we’ll be back to visit, and a safe bet is that my father-and-law and I will pick up the tradition where we left of. This entry was posted in La Vita Italia, Recipes and tagged bakery, Bread, California, Cooking, focaccia, Home, Italy, Olive oil, schiacciata, Signa, Tuscany. Bookmark the permalink.